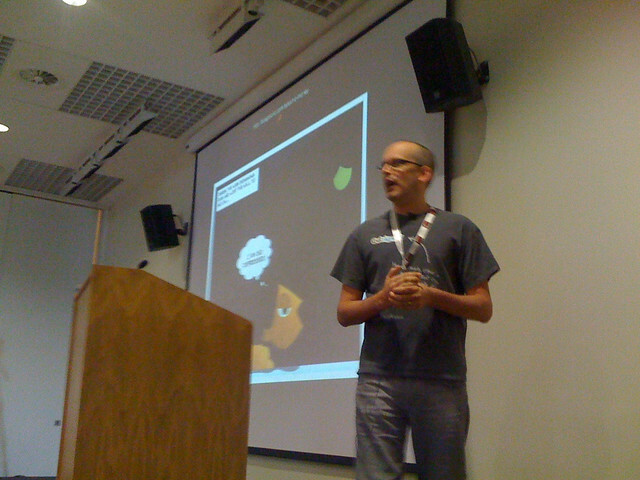 Once again, Paul Boag from Headscape spoke at the Institutional Web Management Workshop, this year in Sheffield. The plenary talk was titled No Money, No Matter and was generally accepted to be one of the highlights of the conference. Much of the content Paul has covered separately on his blog and [failed :-)] podcast but the talk tied it together and brought up some new ideas. You can see Paul’s practice and links to related posts on boagworld.com and the full video is available from Sheffield. Paul often treads a fine line between great advice and a sales pitch but he always does it with a glint in his eye so we’ll allow it! Recently, he has been promoting the idea of bringing in external agencies just for big overhauls of the website and instead have an ongoing relationship. While at Edge Hill we don’t particularly do web design agencies, I wholeheartedly agree that cycles of major redesigns are a bad thing. Just when you think the talk is going to turn into hard sell for Headscape, Paul turns it around and admits for many Universities money is tight and suggests instead HEIs act as “external experts” for each other. This is a fantastic idea and I really want to make this happen for us. Paul suggested monthly meetings with your expert and while I think that might be a little too often, we can see how it goes. So I’m looking for volunteers to come to Edge Hill (we’re based in Ormskirk, Lancashire in case you didn’t know!) and give us free consultancy! In return you’ll get as much coffee as you can drink, a sandwich from the SCR and – if you want – I’ll return the favour and “consult” for your HEI. There’s a few conditions, chiefly I don’t think TPTB would like one of our competitors coming in but other than that I’m open to offers! If you’re interested, drop me an email on michael.nolan@edgehill.ac.uk. Update: after posting on JISCmail’s WEBSITE-INFO-MGT list I received a couple of questions about the areas to be covered. Our team covers design, development and to a large degree content and while we don’t author the majority of information on the site, we do have responsibility for it. So essentially I’m looking for a general expert – someone who can say “that doesn’t look right” or “have you thought about doing cool thing X using HTML5 there”.